Super bright white LED long lasting light. 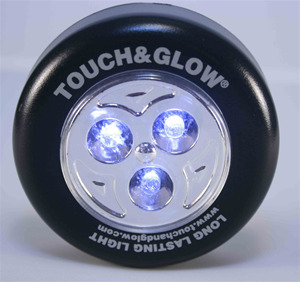 Excellent replacement for old flashlights. Simply push On and push Off for activation. Self-adhesive back, peel and stick to any suitable surface. Use indoor and outdoor. 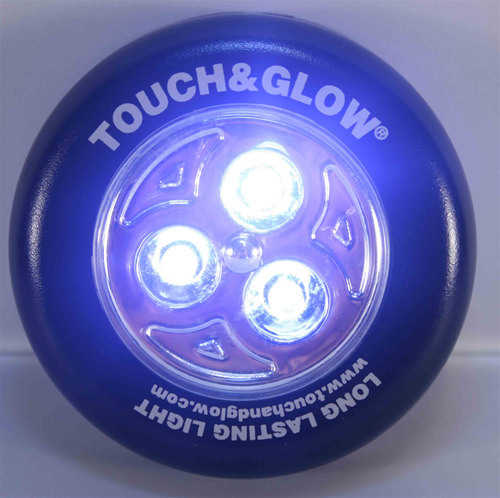 Ideal for bedrooms, bathrooms, under cabinets, closets, autos/RVs, kid's rooms, school lockers, under-the-sink or any place where a handy light is needed. Slim, ultra compact and cool to touch. LED bulb lasts 50,000 hours and does not burn out like old flashlight bulb. Convenient, bright and long lasting with 100+ hours of battery life. Three AAA batteries included with each unit. Black color.